Brearn Wright Jr. will head Roger Williams Middle School. Wright has been a principal or assistant principal in the Washington, D.C., schools since 2005, most recently at the George A. Truesdale(sic) Educational Center, where he hired all new staff and divided the school into four smaller units, from early childhood to middle school. 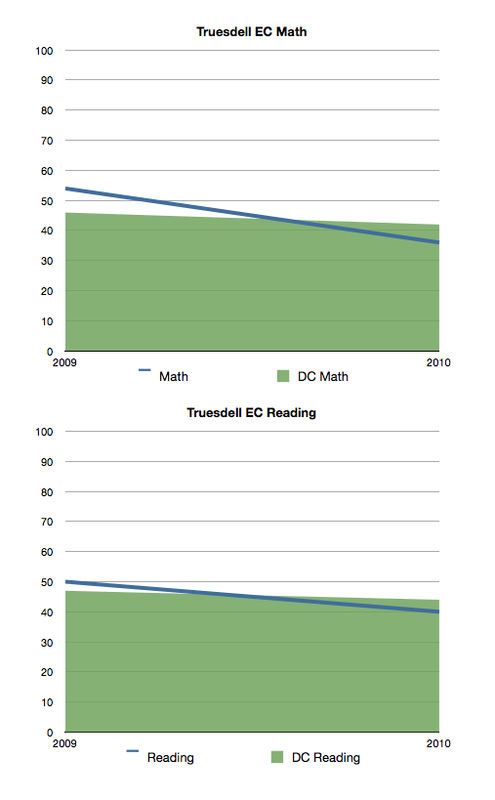 So, how'd Truesdell do on the latest DC CAS scores released this morning? The green area is the DC "state" average, which presumably includes charters and isn't particularly different from the "LEA" proficiency rates. It is actually worse than it looks from those simple graphs, as the percentage at the advanced level in math went from 20.18 to 2.7%, while below basic in math went from 10.6 to 22.8% and below basic in reading went from 12.3 to 21.2%. But Truesdell isn't a no-excuses charter. Surely Democracy Prep NYC, the model for our first mayoral academy that plays such a prominent role in RIDE's reform plans is still looming over the competition? Apologies for switching graph designs on you, I just base these on the most convenient data I can find and make things as clear as I can. So here the grade levels are on the X-axis (6, 7, 8). Democracy Prep is in blue with the dots for data points. The dotted lines are last years DP and NYC reading scores, now regarded as inflated, for comparison. The solid lines are various city and state scores from this year. 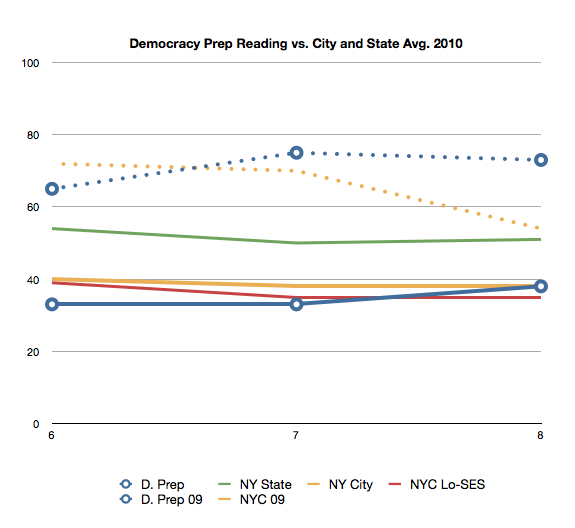 Basically, in 2010 Democracy Prep never got above the city average, and was only three points higher than the NYC New York state rate for economically disadvantaged students (in 8th grade). “We cannot have charter schools — whose whole purpose for existence is to demonstrate innovation that shows significant results — with performance levels that are lower than other schools that don’t have the kind of autonomy and flexibility that charters have,” Gist said. “If their performance isn’t where it should be, it’s an indication that the model they are using didn’t work. LOL! Just kidding, these are schools run by reformers! At least we can take some solace in the fact we didn't hire Michael Bennet as our CFO. Red herring on the Democracy Prep thing. They came in, let's see what they do. In NY, pre-inflation things looked good and now it looks like they're just doing city average (I would be wary of using straight average performance for the whole city and not using performance of the neighborhood schools these students would have attended or controlling for demographics at all, but we both know you want to stack the deck against them and that's fine). The trick about charters is whether their autonomy will allow them to respond to new information and improve even more. By the old metrics they were probably complacent and felt like they were doing pretty well, clearly beating the pants off the rest of NYC (and the state) by 2008. With new data, let's see how they respond before judging them. And of course, while the performance of one school may be good reason to give them a shot here, like all charters, they only get a 5 year chance. If things don't look good in 5 years in RI where they have different school leaders, teachers and students, I'm sure RI will pull the plug. That's one big change between Gist and McWalters-- she seems prepared to use the authority of RIDE to pull the plugs on charters if they're not up to standard. The tricky part is getting those standards right and basing it on the best available data. We'll see how that goes moving into the future as more schools come up for renewal.